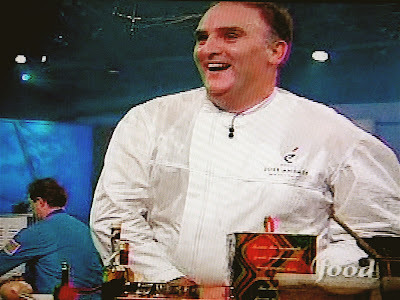 Congratulations to chefs José Andrés, Katsuya Fukushima and Ruben Garcia for defeating Bobby Flay on Food Network's "Iron Chef America" Sunday evening. The team put in a stunning performance, handily beating Flay and his team 55 to 48 in Battle Goat. Andrés turned the secret ingredient into goat tartare wrapped in thinly sliced avocado, topped with caviar and paired with egg yolk, tomato "caviar" and caper foam; goat "cous cous," the cous cous fashioned from cauliflower florets; barbecue goat ribs and "corn on the cob," served in a dome of applewood smoke; goat tenderloin with Serrano ham and mashed potatoes; and finally, goat milk sorbet with red wine capsules. 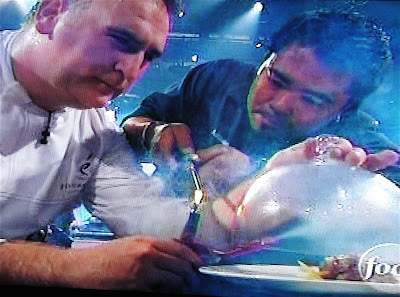 Pictured above, Andrés and Fukushima prompted a series of bong jokes from host Alton Brown as they funneled the smoke into the dome for the goat ribs dish. A full house gathered at Jaleo in Crystal City to cheer on Andrés. 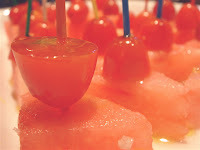 Too lazy to leave the house, I served a take on Andrés' tomato and watermelon skewers "Ferran Adria" (pictured; recipe here) and garlic shrimp from Andrés' book "Tapas: A Taste of Spain in America" (recipe here), Spanish cheeses, Catalan olives, Marcona almonds, chorizo, Serrano ham and a few bottles of Rioja. Andrés is the chef and owner of three Jaleos, Café Atlantico, minibar, Zaytinya and Oyamel. Fukushima is the head chef of Café Atlantico, and along with Andrés, he and Garcia oversee much of the innovative minibar. At the Beard awards May 7, Jose and Flay are to be inducted into the Foundation's Who's Who of Food & Beverage in America along with three others including Michael Pollan. I missed that in the original nominee announcements. I guess it's OK to take the bong off the mantel and place it in the kitchen where it belongs. It was a wonderful show, does anyone know how he made the red wine capsules. I'd love to know.